Chanteur et accordéoniste US né le 25 Juin 1925 à Apelousas (Louisiane). Clifton Chenier est décédé le 12 Décembre 1987 à Lafayette (Louisiane). 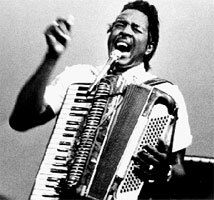 The undisputed "King of Zydeco," Clifton Chenier was the first Creole to be presented a Grammy award on national television. Blending the French and Cajun 2-steps and waltzes of southwest Louisiana with New Orleans R&B, Texas blues, and big-band jazz, Chenier created the modern, dance-inspiring, sounds of zydeco. A flamboyant personality, remembered for his gold tooth and the cape and crown that he wore during concerts, Chenier set the standard for all the zydeco players who have followed in his footsteps. In an interview from Ann Savoy's book, Cajun Music: Reflection of a People, Chenier explained, "Zydeco is rock and French mixed together, you know, like French music and rock with a beat to it. It's the same thing as rock and roll but it's different because I'm singing in French." The son of sharecropper and amateur accordion player, Joe Chenier, and the nephew of a guitarist, fiddler, and dance club owner, Maurice "Big" Chenier, Chenier found his earliest influences in the blues of Muddy Waters, Peetie Wheatstraw, and Lightnin' Hopkins, the New Orleans R&B of Fats Domino and Professor Longhair, the 1920s and '30s recordings by zydeco accordionist Amede Ardoin and the playing of childhood friends Claude Faulk and Jesse and Zozo Reynolds. Acquiring his first accordion from a neighbor, Isaie "Easy" Blasa in 1947, Chenier was taught the basics of the instruments by his father. 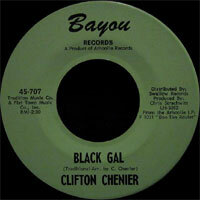 By 1944, Chenier was performing, with his brother Cleveland on frottoir (rub-board) in the dance halls of Lake Charles. Moving to New Iberia in the mid-'40s, Chenier worked in the sugar fields cutting sugar cane. After moving, to Port Arthur, TX, in 1947, he divided his time between driving a refinery truck and hauling pipe for Gulf and Texaco and playing with his brother. 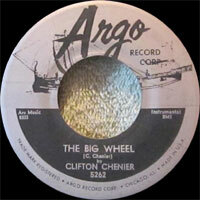 In 1954, Chenier signed with Elko Records. His first recording session, at Lake Charles radio station KAOK, yielded seven tunes including the regional hit single, "Cliston's Blues" and "Louisiana Stomp." 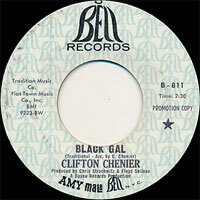 Chenier's first national attention came with his first single for the Specialty record label, "Ay Tete Fille (Hey, Little Girl)," a cover of a Professor Longhair tune, released in May 1955. The song was one of 12 that he recorded during two sessions produced by Bumps Blackwell, best known for his work with Little Richard. By 1956, Chenier had left his day job to devote his full-time attention to music, Touring with his band, the Zydeco Ramblers, which included blues guitarist Philip Walker. The following year, Chenier left Specialty and signed with the Chess label in Chicago. Although he toured, along with Etta James, throughout the United States, Chenier's career suffered when the popularity of ethnic and regional music styles began to decline. Although he recorded 13 songs for the Crowley, LA-based Zynn label, between 1958 and 1960, none charted. The turning point in Chenier's career came when Lightnin' Hopkins' wife, who was a cousin, introduced Chris Strachwitz, owner of the roots music label, Arhoolie, to his early recordings. 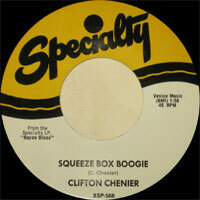 Strachwitz quickly signed Chenier to Arhoolie, producing his first single, "Ay Yi Yi"/"Why Did You Go Last Night?," in four years. Although they continued to work together until the early '70s, Chenier and Strachwitz differed artistically. 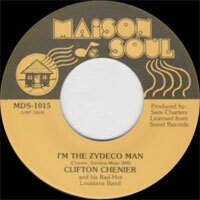 While Chenier wanted to record commercial-minded R&B, Strachwitz encouraged him to focus on traditional zydeco. 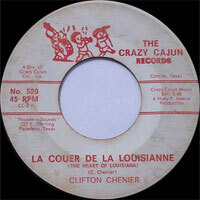 Chenier's first album for Arhoolie, Louisiana Blues and Zydeco, featured one side of blues and R&B and one side of French 2-steps and waltzes. 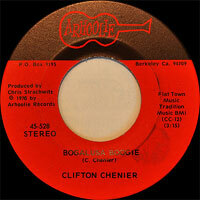 In 1976, Chenier recorded one of his best albums, Bogalusa Boogie, and formed a new group, the Red Hot Louisiana Band, featuring tenor saxophonist "Blind" John Hart and guitarist Paul Senegal. 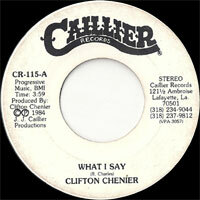 Chenier reached the peak of his popularity in the '80s. In 1983, he received a Grammy award for his album, I'm Here!, recorded in eight hours in Bogalusa, LA. The following year, he performed at the White House. Although he suffered from kidney disease and a partially amputated foot and was required to undergo dialysis treatment every three days, Chenier continued to perform until one week before his death on December 12, 1987. Following his death, his son, C.J. Chenier, took over leadership of the Red Hot Louisiana Band. A documentary video of Chenier's performances at the San Francisco Blues Festival, the New Orleans Jazz and Heritage Festival, and on Louisiana television was released by Arhoolie. 1957 SP ARGO 5262 (US) . The Big Wheel / Where Can My Baby Be? 197? SP CRAZY CAJUN 800 (US) . You Promised Me Love / ? 1977 ? SP MAISON DE SOUL 1015 (US) . I'm The Zydeco Man / ? 1984 SP CAILLIER CD-115 (US) . 1984 LP 12" CALLIER 8401 (US) COUNTRY BOY NOW GRAMMY WINNER 1984 ! - My Baby She's Gone To Stay / Driftin' Blues / Tutti Fruitti / Love Me Or Leave Me / Old Time Waltz / Zydeco Boogie / What'd I Say / Moon Is Rising Blues / Zydeco Jazz / Zydeco Is Back Again / Mama Told Papa / Tired Of Being Alone.